Artist's rendering of a nuclear explosion targeting a city. This is a list of projected numbers of casualties should a nuclear weapon be detonated in a certain city or other population center. The effects of any nuclear explosion is dependent of a very large number of factors, including but not limited to type of nuclear device, delivery method, explosion type (whether air burst or surface burst), the target's structural anatomy, and atmospheric conditions. To estimate the number of casualties in addition to this poses an even greater challenge. 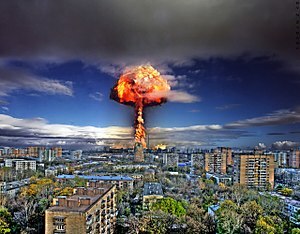 A nuclear explosion may not hit a city directly. If distinguished, this list uses the estimate with the shortest distance. Any nuclear attack will have consequences far beyond the area directly affected by the explosion, and the people killed in the nuclear fireball and its immediate radiation. Aside from the political, military and tactical considerations of nuclear attacks on civilians, additional effects include the subsequent nuclear fallout which spreads radioactive particles across large distances, the potential of nuclear winter and other nuclear-related climate change, and the long-term effects of radioactive exposure on human health, such as radiation-induced cancer. If distinguished, this list takes into account immediate deaths and short-term deaths, and not long-term health complications. This list only includes casualties made from hypothetical nuclear scenarios and does not include death tolls from actual nuclear attacks. Nuclear weapons have only been used in combat twice throughout history and in a form of a strategic weapon, during the bombings of Hiroshima and Nagasaki in World War II, which killed approximately 105,000 people. ^ Here described is the population which was used during the death toll estimate, and may differ significantly from the current population. It may be completely wrong even for the relevant time period. If no population figure is given, the historical population count is acquired from another source. ^ Office of Technology Assessment (1979). The Effects of Nuclear War. Office of Technology Assessment. LCCN 79-600080. ^ Buddemeier, B. R.; Valentine, J. E.; Millage, K. K.; Brandt, L. D. (2011). Key Response Planning Factors for the Aftermath of Nuclear Terrorism. Lawrence Livermore National Laboratory. LLNL-TR-512111. ^ Dibb, Paul (September 10, 2005). "America has always kept us in the loop". The Australian. ^ a b c Dallas, Cham E.; Bell, William C.; Stewart, David J.; Caruso, Antonio; Burkle, Jr., Frederick M. (May 10, 2013). "Nuclear war between Israel and Iran: lethality beyond the pale". Conflict and Health. 7 (10). doi:10.1186/1752-1505-7-10. Retrieved January 4, 2018. ^ a b Zagurek, Jr., Michael J. (October 3, 2017). "A Hypothetical Nuclear Attack on Seoul and Tokyo: The Human Cost of War on the Korean Peninsula". 38 North. Retrieved January 4, 2018. NUKEMAP, a (non-scientific) interactive simulator for nuclear explosions and the effects and casualties thereof.